This is the daybed of all daybeds. The WOW factor. The conversation piece. The daybed you’ll want to spend your lazy days on. Hand carved using recycled timber. 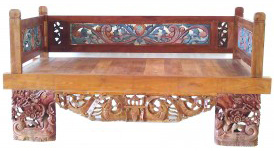 Carving and colour vary with every daybed, so each one is unique. It is also available with a white wash finish. The back & side panels can be removed, so it will fit through most doorways.